will be performed, with the mouse bed assembly. Scientific leader of the project: Carles Arús. This services allows for selection from a panoply of contrast agents, to ensure that only the best ones will reach the most advanced and expensive in vivo phase. This service, offered by NANBIOSIS, provides a complete pathway for synthesis, physicochemical characterization, biocompatibility and toxicity evaluation, and preclinical validation through magnetic resonance of new compounds with potential for contrast agents in magnetic resonance imaging (MRI). Possible path for the characterization of a new compound with potential as MR contrast agent in a murine preclinical model. A new ex vivo method to evaluate the performance of candidate MRI contrast agents: a proof-of-concept study.Candiota AP, Acosta M, Simoes RV, Delgado-Goni T, Lope-Piedrafita S, Irure Yoldi A, Marradi M, Bomatí-Miguel O, Miguel-Sancho N, Abasolo I, Schwartz Jr. S, Santamaria J, Penadés S, Arús C, Journal of Nanobiotechnology, 2014. 12(12). DCE@urLAB: a dynamic contrast-enhanced MRI pharmacokinetic analysis tool for preclinical data. Ortuño, J.E., et al., BMC Bioinformatics, 2013. 14: p. 316. Internalization studies with confocal microscopy and GL261 cells (mouse glioblastoma) and evaluation of cell viability. Studies of r1 and r2 relaxivity at different concentrations in the 7T Biospec with model solutions (phantoms).Study of r1/r2 ration and possible use as T1 and/or T2 agent.Comparisons with commercially available contrast agents being used in clinical practice.Postmortem MRI with stereotactic injection of the contrast agent for evaluation in an environment mimicking in vivo; comparison with commercially available agents . In vivo tolerability studies in mice, with maximum tolerated dose calculation (MTD) . Dynamic contrast-enhancement MRI (DCE-MRI) in a murine preclinical model (e.g. GL261 glioblastoma), with calculation of DCE-derived parameters as T1 max and Kep (U25) .See a possible schema in Figure 1. Axial MRI from mouse (C57BL/6) brain with a glioblastoma GL261 tumor, before and after injection of a nanoparticulated contrast agent. 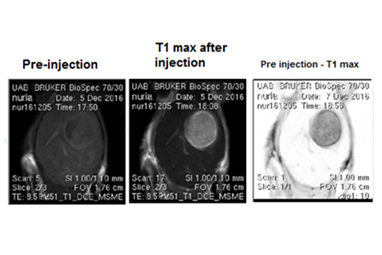 From left to right: T1 weighted MRI pre contrast agent administration, T1 weighted MRI post contrast agent administration and the image obtained by the difference between the two prior ones.